Agnes lowers the latest issue of The Illustrated London News to her lap, offended and upset. An article has just informed her that the average English woman has 21,917 days to live. Why, oh why must newspapers always be so disagreeable? Have they nothing better to do? The world is going to the dogs. Michel Faber’s vast expanse of a novel delves into the life of a nineteen year old prostitute named Sugar. And by vast expanse of a novel, I mean it’s a doorstop. I sometimes felt awkward bringing it with me wherever I went because it’s so large. But it’s one of those novels that doesn’t feel large and impossible at all. It’s so engaging and lush that you very nearly believe you’re right there in 19th century London. I read The Crimson Petal and the White many, many years ago, before I decided to go for my degree in English and before I really knew anything about post-modernism and Victorian literature. When I read it for the first time, I read it for the historical fiction aspect of the novel. Historical fiction, especially fiction set in England, is one of my favorite things to read, so naturally, a huge one that’s vaguely scandalizing was something meant for me. Postmodernism articulates a world that is culturally one of multiplicity, diversity, contingency, fragmentation and rupture and accepts that we now live in a state of perpetual incompleteness and permanent unresolve. Postmodernism promotes the notion of radical pluralism, many ways of knowing, and many truths. From a postmodern perspective knowledge is articulated from local perspectives, with all its uncertainties, complexity and paradox. This viewpoint suggests that knowledge is relational and that all reality is woven and rewoven on shared linguistic looms. It’s one of those -isms that can never fully be explained because of the definition itself, but that’s one I particularly enjoy for a semblance of clarity. Anyway, not to digress too much, Faber touches on this post-modern viewpoint in the terminology of itself and in the fact that one cannot return to Victorian England, so that viewpoint of that time is through the lenses of our own time. We, as readers, cannot help but interject our own views and perceptions of the world upon this as the author imposes his view of the time on us in tandem. The narrator plays with the reader on several occasions, dropping little bits about the state of women in that time and about authorship itself. Both Sugar and William aspire to be authors, but for William it’s an occupation, but for Sugar the prostitute it’s a means to pass the time with hopeful abandon; and Agnes writes vivid accounts in her diaries, which give major insight into her madness, only to discard them in a frantic act. 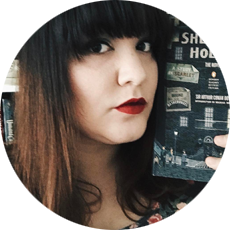 Other characters speak about authorship, being an author, or even comparing their roles in life to roles in a novel throughout the course of the book. “You ain’t a norfer, are ye?” he asks. Henry repeats the strange word to himself silently, straining to divine its meaning. “I beg your pardon?” he’s obliged to ask. Sugar steps back, confused: if she’s so superior in rank to the household servants, where does she get her deep-seated notion that governesses are lowly and despised? From novels, she supposes – but aren’t novels truth dressed up in fancy clothes? 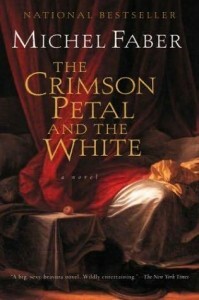 The Crimson Petal and the White offers so much to a variety of readers, and that’s what I’ve enjoyed about it the second time around. My biggest frustration about it is the ending. It’s a bit abrupt, there isn’t much explanation as to why what’s done is done, and in some ways it reads to me as if Faber had to end somewhere otherwise it would continue on and on for ages. He’s apparently published a collection of stories set before and after the novel called The Apple that others have said read like “deleted scenes,” so I think I’ll have to find that in the library for further reading. I’m most desperate to know what happens to Sophie, William and Agnes’ daughter. There is so much detail to delight in as you read this novel. Faber is a master at weaving those old world ideas and sensibilities with our modern perceptions in this, and you hardly know where one ends and one begins. It’s incredibly enjoyable, and I’m glad it’s my first read of 2016. And to you also: goodbye. An abrupt parting, I know, but that’s the way it always is, isn’t it?